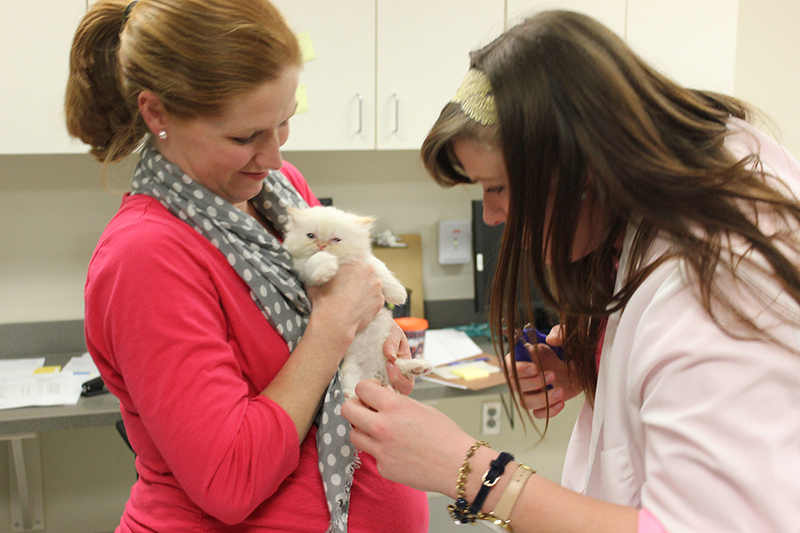 The sounds of mewing kittens echoed throughout the Wilford and Kate Bailey Small Animal Teaching Hospital as owner Cheryl Jones and College of Veterinary Medicine faculty Dr. Aime Johnson and Dr. Robyn Wilborn held three adorable Himalayan kittens. The three kittens – Yarny, Mearie and Pippin – are alive due the medical treatment provided to their mother, Tigress, a Himalayan cat, at the teaching hospital’s Theriogenology Service for companion animals experiencing reproduction issues. Tigress had lost previous litters due to her inability to produce milk. The Theriogenology Service provides medical care for animals whose owner choose to use the service and educates senior-level veterinary students about reproduction. Auburn is one of three veterinary medical programs in the U.S., and the only one in the South, to have a Residency program in Theriogenology, funded by the American Kennel Club and the Theriogenology Foundation. One of the kittens is examined by Dr. Wilborn and Dr. Fraser. Dr. Johnson, an assistant professor specializing in theriogenology, first saw Tigress almost a year ago, and she recognized theriogenology residents Drs. Rochelle Jensen and Natalie Fraser who took the lead in Tigress’ care. While there was no clear diagnosis as to why Tigress couldn’t produce milk needed to nurse her litters, veterinarians and her owner decided to treat Tigress with a safe hormone to stimulate lactation once she was pregnant. The timing, however, of administering the hormone, was important. Starting Tigress on the hormone at just the right time paid off. The kittens were born week later and the Momma cat began nursing immediately. Jones brought Tigress, the kittens, and the father cat to the teaching hospital within hours of birth, which Dr. Johnson said was perfect timing. The kittens were also given a serum produced from a sample of the father’s blood, which helped to boost their immune system.